The advance in ease of handworking may largely be measured by the facilities for holding materials or other tools. The primitive man used no devices for holding except his hands and feet. The Japanese, who perhaps are the most skilful of joiners, still largely use their fingers and toes. On the other hand, Anglo-Saxons have developed an enormous variety of methods for holding work and tools. Fig. 166. Bench made with Pinned Mortise-and-Tenon Joints, Low Back. Fig. 167. 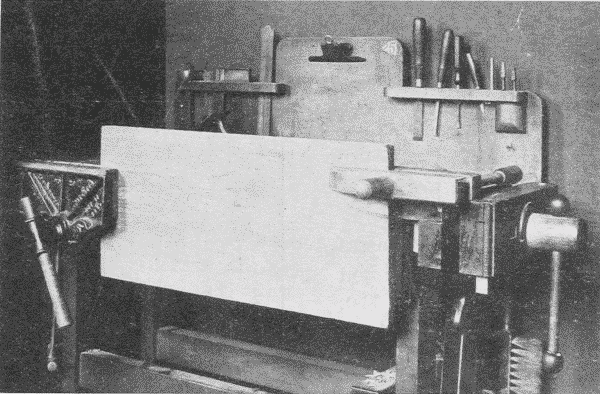 Woodworking Bench used at Pratt Institute, Showing Self-Adjusting Upright Vise. Benches. The essential features of a work-bench are a firm, steady table with a vise and places for tools. The joints are either pinned or wedged mortise-and-tenon, or draw-bolt joints. The best benches are made of maple, the tops being strips joined or tongued-and-grooved together. 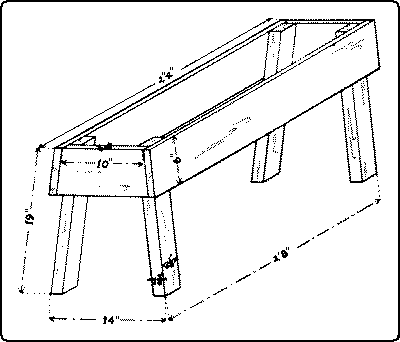 It is common also to have a trough at the back of the top of the bench, i. e., a space 6″ or 8″ wide, set lower than the upper surface, in which tools may be placed so as not to roll off. 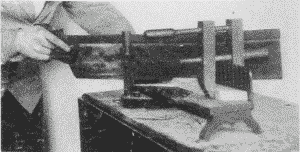 A low pillow, fastened at the left hand end of the trough, on which to set planes in order that the edge of the cutter may not be injured, is an advantage. The tool-rack is of capital importance. It has been common in school benches to affix it to a board, which rises considerably above the top of the bench, Fig. 169, but a better plan is to have the top of it no higher than the bench-top, Fig. 166. Then the light on the bench is not obscured, and when a flat top is needed for large work it can readily be had by removing the tools. Elaborate benches with lock drawers are also much used in the shops of large city schools. Fig. 168. 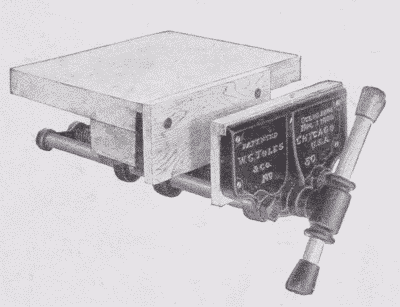 A Rapid-Acting Vise. Vises for holding wood are of three general styles, (1) those with an upright wooden jaw, Fig. 167, which holds wide pieces of work well. 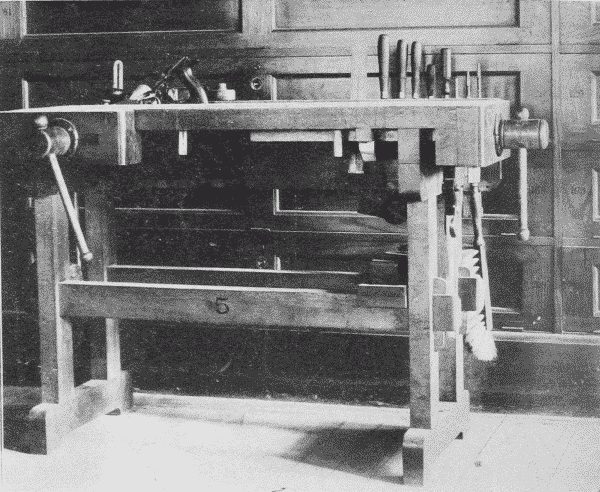 They are now made with an automatic adjusting device by which the jaw and the face of the bench are kept parallel; (2) wooden vises with a horizontal jaw, guided by parallel runners, Fig. 166, and, (3) metal rapid-acting vises, Fig. 168. The latter are the most durable and in most respects more convenient. Special vises are also made for wood-carvers, for saw-filing, etc. Fig. 169. Holding a Large Board in Vise for Planing. The best woodworking benches are equipped with both side- and tail-vises. The tail-vise is supplemented by movable bench-stops for holding pieces of different lengths. In planing the side of a board it is held in place between the tail-vise and one of the bench-stops. A board should not be squeezed sidewise between the jaws of a vise when it is to be planed, lest it be bent out of shape. In planing the edge of a board it is ordinarily held in the side-vise. A long board, one end of which is in the vise, may also need to be supported at the other end. This may be done by clamping to it a handscrew, the jaw of which rests on the top of the bench, Fig. 169. When the vise is likely to be twisted out of square by the insertion of a piece of wood at one end of it, it is well to insert another piece of equal thickness at the other end of the vise to keep it square, as in Fig. 120, p. 82. In this case, (Fig. 120,) the extra piece also supports the piece being worked upon. The vise is also of great use in carrying on many other processes, but a good workman does not use it to the exclusion of the saw-horse and bench-hook. Horses are of great use both for the rough sawing of material and in supporting large pieces during the process of construction. The common form is shown in Fig. 170, but a more convenient form for sawing has an open top, as in Fig. 171. 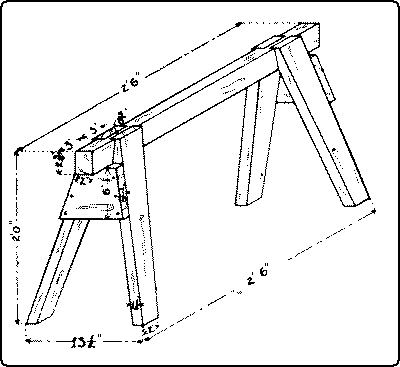 The picture-frame-vise, Fig. 172, is a very convenient tool for making mitered joints, as in picture-frames. The vise holds two sides firmly so that after gluing they may be either nailed together or a spline inserted in a saw cut previously made. See Fig. 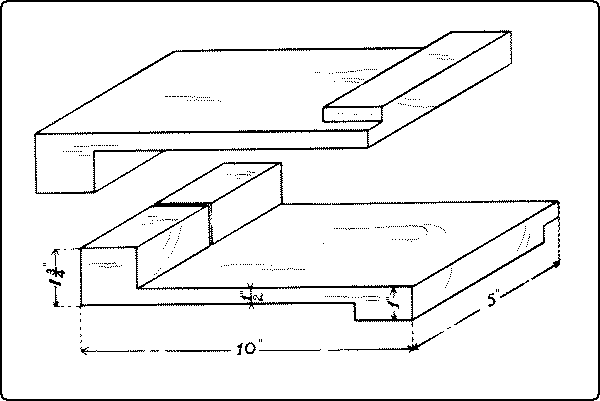 268, If the last joint in a picture-frame does not quite match, a kerf may be sawn at the junction of the two pieces, which can then be drawn close together. 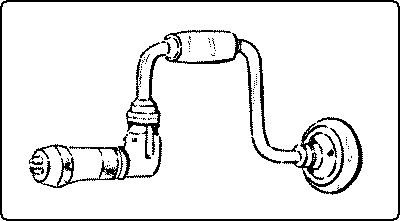 Handscrews, Fig. 173, consist of four parts, the shoulder jaw and the screw jaw, made of maple, and the end spindle and the middle spindle, made of hickory. The parts when broken can be bought separately. 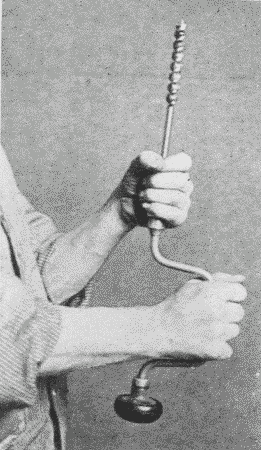 Handscrews vary in size from those with jaws four inches long to those with jaws twenty-two inches long. The best kind are oiled so that glue will not adhere to them. 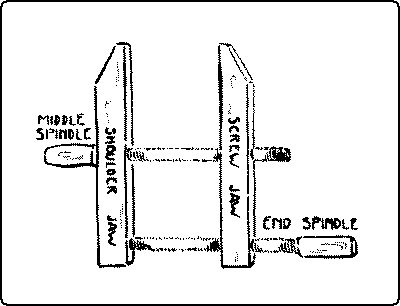 In adjusting the jaws, if the handle of the middle spindle is held in one hand, and the handle of the end spindle in the other hand, and both are revolved together, the jaws may be closed or opened evenly, Fig. 174. In use care must be taken to keep the jaws parallel, in order to obtain the greatest pressure and to prevent the spindles from being broken. It is always important to have the jaws press on the work evenly. To secure this, the middle spindle should be tightened first, and then the end spindle. Handscrews are convenient for a great variety of uses, as clamping up glued pieces, holding pieces together temporarily for boring, Fig. 247, holding work at any desired angle in the vise, as for chamfering or beveling, Fig. 175, etc. Fig. 175. Using a Handscrew to hold a Board at an Angle. Clamps are made of both wood and iron, the most satisfactory for speed, strength, and durability are steel-bar carpenter clamps, Fig. 176. They vary in length from 1½ ft. to 8 ft. The separate parts are the steel bar A, the cast-iron frame B, the tip C into which fits the screw D, on the other end of which is the crank E, and the slide F with its dog G, which engages in the notches on the bar. Any part, if broken, can be replaced separately. Fig. 176. Steel-Bar Carpenter’s Clamp. a. Steel Bar. b. Frame. c. Tip. d. Screw. e. Crank. f. Slide. g. Dog. Iron Handscrews, also called C clamps and carriage-makers’ clamps. Fig. 177, are useful in certain kinds of work, as in gluing in special places and in wood-carving. All iron clamps need blocks of soft wood to be placed between them and the finished work. Fig. 177. 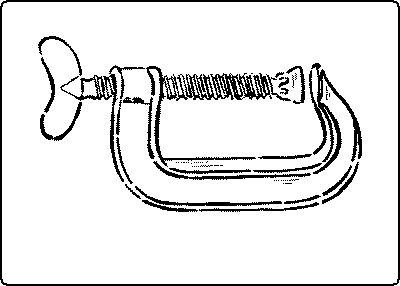 Iron Handscrew, (Carriage-Maker’s Clamp). Pinch-dogs, Fig. 178, are a convenient device for drawing together two pieces of wood, when injury to the surfaces in which they are driven does not matter. They vary in size from ¾” to 2¾”. For ordinary purposes the smallest size is sufficient. For especially fine work, double-pointed tacks, properly filed, are convenient. 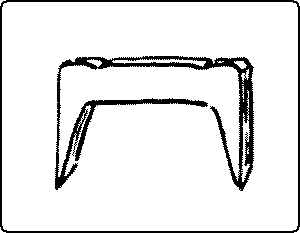 The bench-hook, Fig. 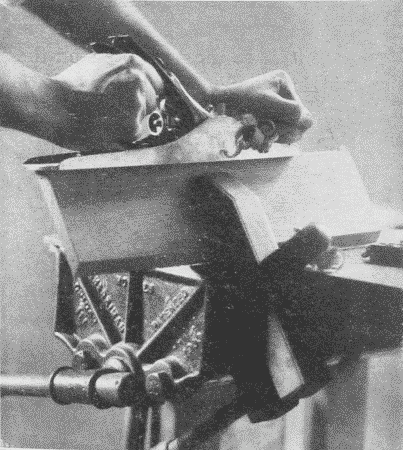 179, is a simple device for holding firmly small pieces of work when they are being sawn, chisled, etc. It also saves the bench from being marred. The angles should be kept exactly square. The miter-box, Fig. 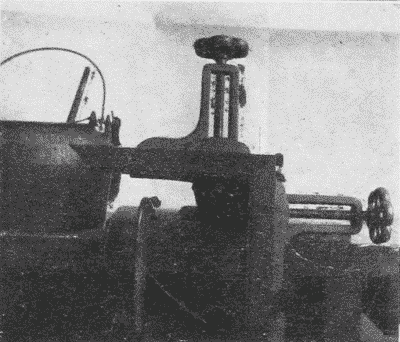 180, is a similar device with the addition of a guide for the saw. 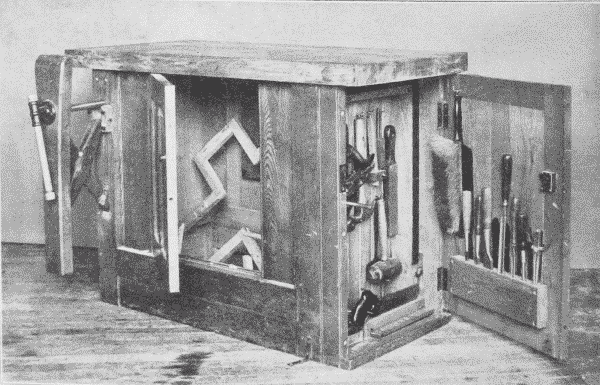 The iron miter-box, Fig. 181, with the saw adjustable to various angles, insures accurate work. Such tools as pliers, Fig. 182, pincers, Fig. 183, and nippers, Fig. 184, made for gripping iron, are often useful in the woodworking shop. So are various sorts of wrenches; as fixed, socketed, adjustable, monkey- and pipe-wrenches. Fig. 182. 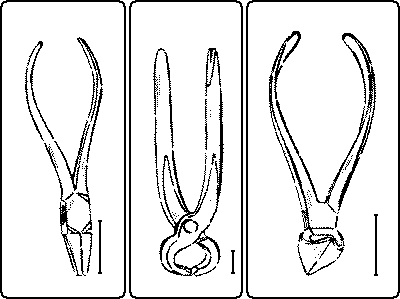 Pliers. Fig. 183. Pincers. Fig. 184. Nippers. B. Tools for holding other tools. The brace or bit-stock, Fig. 185, holds all sorts of boring tools as well as screwdrivers, dowel-pointers, etc. The simple brace or bit-stock consists of a chuck, a handle, and a knob, and is sufficient for ordinary use; but the ratchet-brace enables the user to bore near to surfaces or corners where a complete sweep cannot be made. It is also useful where sufficient power can be applied only at one part of the sweep. By means of pawls which engage in the ratchet-wheel, the bit can be turned in either direction at the will of the user. 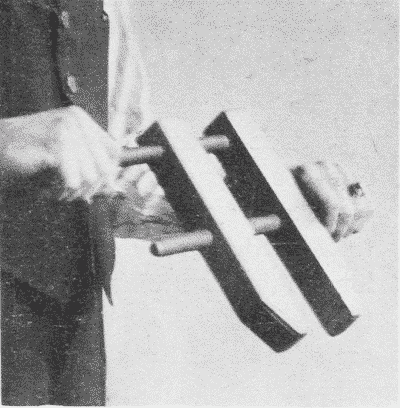 The size of the brace is indicated by the “sweep,” that is, the diameter of the circle thru which the swinging handle turns. To insert a bit or other tool, Fig. 186, grasp firmly with one hand the sleeve of the chuck pointing it upward, and revolve the handle with the other hand, unscrewing the sleeve until the jaws open enough to admit the whole tang of the bit. Then reverse the motion and the bit will be held tightly in place. Various hand-, breast-, bench-, bow-drills and automatic drills are of use in doing quick work and for boring small holes, Fig. 187. Fig. 186. Inserting a Bit in Stock. The screwdriver, Fig. 188, is a sort of holding tool for turning, and so driving screws. Various devices have been tried to prevent the twisting in the handle. This is now practically assured in various makes. The other important matter in a screwdriver is that the point be of the right temper, so as neither to bend nor to break. If the corners break they can be reground, but care should be taken not to make the angle too obtuse or the driver will slip out of the slot in the screw-head. The bevel should have a long taper. A shop should be equipped with different sizes of screwdrivers to fit the different sizes of screws. 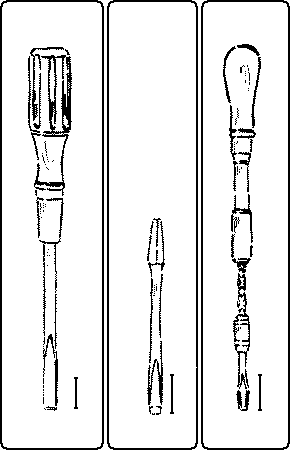 Screwdrivers vary in size, the shank ranging in length from 2½” to 18″. A long screwdriver is more powerful than a short one, for the screwdriver is rarely exactly in line with the axis of the screw, but the handle revolves in a circle. This means an increased leverage, so that the longer the screwdriver, the greater the leverage. Fig. 188. Screwdriver. Fig. 189. Screwdriver-Bit. Fig. 190. Spiral Screwdriver. For heavy work, screwdriver-bits, Fig. 189, in a bit-stock are useful, and for quick work, the spiral screwdriver, Fig. 190, and for small work, the ratchet-screwdriver.